(a) Photograph of two NGAs (cylinder size: diameter 1.9 cm, length 1.2 cm) standing on a Calliandra haematocephala flower. (b) SEM image of the sample in (a). (c) Typical TEM image of the NGA. (d) HRTEM image of the NGA. Marine mussels may not be an obvious first step on the route to developing a material to soak up oil spills or act as a chemical sensor, but a team from China’s Xiamen University did just that. Combining the adhesive properties of mussel with the mechanical properties of graphene, they produced a bio-inspired aerogel with high absorption capacity. Graphene’s unique combination of electrical, thermal and mechanical properties positions it firmly at the top of the nanomaterials agenda. One route to transferring its properties into larger scale structures is to prepare graphene sheets in the form of an aerogel. To do this, the researchers, led by Xi Chen, looked to the properties of dopamine, a molecule that mimics the adhesive proteins found in marine mussels. Published in Carbon 80 (2014) 174–182 (DOI:10.1016/j.carbon.2014.08.054), Chen’s paper reports on the low-cost development of a nitrogen-doped graphene structure. Because dopamine spontaneously polymerizes, and can modify virtually all material surfaces, it can be a good adhesive. It also a source of nitrogen atoms, which dopes graphene, enhancing its electrocatalytic properties. A graphene-dopamine gel was first prepared and annealed at 800 °C, to form an ultra-low density aerogel. Structural characterisation showed that the aerogel consisted of a network of twisted and cross-linked graphene sheets that formed nano- and micro-pores. 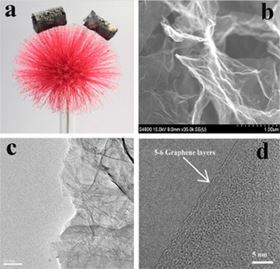 The nitrogen atoms from the dopamine were shown to be incorporated into the carbon–carbon bonds of the graphene, and the aerogel exhibited excellent electrochemical activity. The mechanical properties of the aerogel were also remarkable. A 10 mg piece could sit on a delicate flower without causing any damage, but could also support 5000 times its own weight. The surface of the aerogel was found to be hydrophobic, so when combined with its remarkable mechanical stability, demonstrated that the aerogel would be an ideal candidate for highly efficient extraction of organic pollutants and oils. In tests, the aerogel was shown to absorb liquids (including pump oil, chloroform and diesel) of up to 156 times its own weight. The absorbed liquids could also be removed by direct combustion in air. The team are confident that their graphene-aerogels have a wide range of potential applications, from use as a suction skimmer in marine oil spillage, to an electrode material for electrochemical sensors. The hairy leaves of aquatic ferns can help to clean oil spills.